Own a piece of the movie! 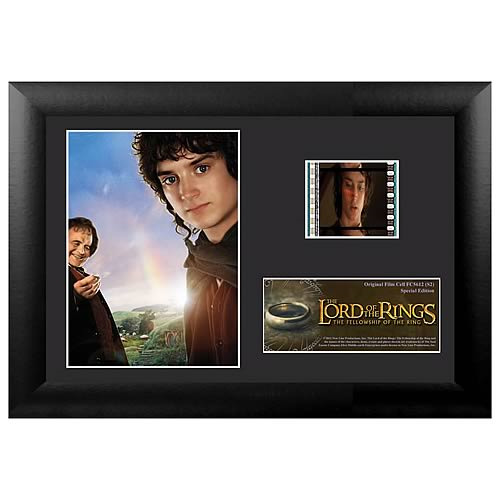 Features Frodo and Bilbo Baggins, beautifully mounted and framed! This amazing series 2 mini film cell features a print and an actual strip of film from Lord of the Rings: The Fellowship of the Ring. Measures 7-inches wide x 5-inches tall. Perfect for displaying in your home or at the office, all the elements are framed in black wood and includes a certificate of authenticity. Ages 13 and up. The Lord of the Rings: The Fellowship of the Ring collectively tells the story of Frodo Baggins, a Hobbit who battles against the Dark Lord Sauron to save his world, Middle-earth, from the grip of evil. NOTE: The actual strips of film vary from piece to piece as they are hand picked from reels of film.